Harry Potter Instrumental Solos Clarinet Book & MP3 CD. 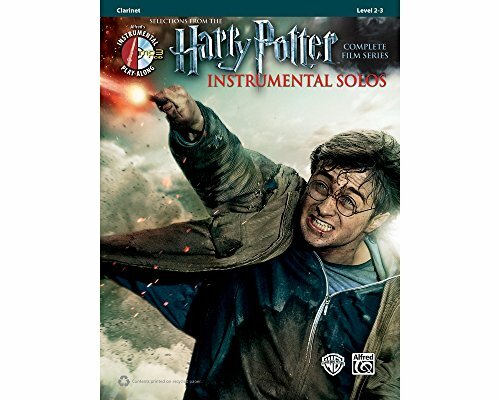 Part of Alfred's Harry Potter Instrumental Solos series this songbook is arranged for clarinet.. All the arrangements are fully compatible and can be successfully performed as ensembles or solos by students who have completed the first book of any standard band method. A fully orchestrated accompaniment MP3 CD is provided, featuring each song as a live performance demo track followed by a play-along track. Song titles include: "Double Trouble" "Family Portrait" "Farewell to Dobby" "Fawkes the Phoenix" "Fireworks" "Harry in Winter" "Harry's Wondrous World" "Hedwig's Theme" "Hogwarts' Hymn" "Hogwarts' March" "Leaving Hogwarts" "Lily's Theme" "Obliviate" "Statues" "A Window to the Past" "Wizard Wheezes"